Kaiser Permanente, Oakland, California, has opened the first of several new medical centers it will build in Southern California that could take patient care and overall experience to a higher level. The words “vacation” and “hospital” are rarely used in the same breath—unless the former happens to lead to a stay in the latter. For some patients at Rigshospitalet in Copenhagen, Denmark, however, a new hotel concept provides the opportunity to find a comfortable escape while receiving treatment at the hospital. A study published in the American Journal of Infection Control reveals the five primary high-touch surfaces in operating rooms (ORs): the anesthesia computer mouse, OR bed, nurse computer mouse, OR door and anesthesia medical cart. Researchers say the impetus for the study was to follow up on a 2010 Centers for Disease Control and Prevention list that recommended high-touch hospital areas to clean, but did not include the operating room in its study. Learn more at the Infection Prevention by Design Workshop - register now and get early bird savings! An energy-saving project that included optimizing the building automation system (BAS) at one hospital and retrocommissioning the system at a second facility cut energy costs at UF Health, Gainesville, Fla., by more than $5 million in less than five years. 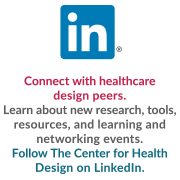 Have you wondered what evidence-based design (EBD) is and why it’s important? Or are you EDAC-certified and planning or designing a project and want to use the EBD process? If so, attend this in-depth workshop to work directly with industry experts to learn from their years of evidence-based design experience. The Environments for Aging Expo & Conference is an annual event that brings together developers, owners, design professionals, product manufacturers, academia, aging specialists, and government officials to explore new ideas for creating places that support people as they age. Developed by professionals who are day-to-day advocates and champions for improving healthcare and life experiences for the aging population, this comprehensive conference provides attendees with access to state-of-the-art information from thought leaders and innovators within the field of aging. In the Insights & Solutions portion of The Center's website, the "Open Access" tab provides many free resources, including member projects, blogs and tools.